This event is being organized in an effort to help undocumented students reach their educational goals. 100% of the money raised will go towards scholarships for undocumented students in LA who have aspirations of going to college!! Support our young Raza that want to go to college!! 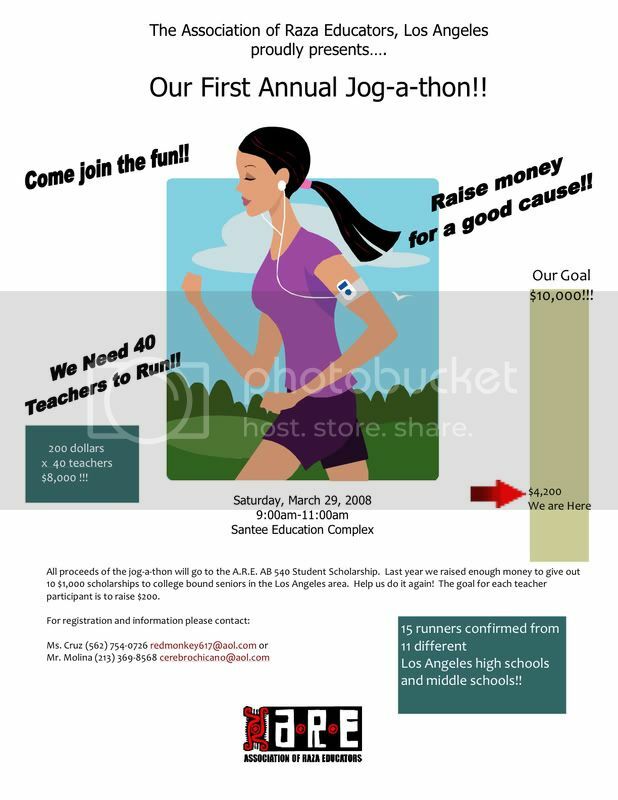 Each teacher needs to raise $200 each. If you want to donate some $$$ (it can be ANY amount...no amount is to small) you can make a check out to "Raza Education Fund" or you can also just donate online. Just click on the "Donate" link in the red box on the left hand side of the page! And if you are BROKE, no worries, it's all good! ARE is ALWAYS going to be raising $$$ for undocumented students so you can donate when you get some cash! Come out Saturday and cheer on all of the runners!! It's going to be a good time! WE ACTUALLY HAVE OVER 30 RUNNERS BUT WE WOULD LIKE TO HAVE MANY MORE!!! !